I'm not sure if I have been reading too many odd books, or my mood was just right, but I really enjoyed this book! 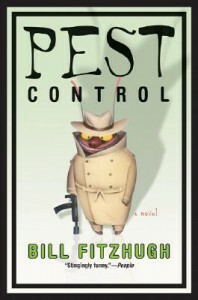 Nothing spectacular, but a fun combination of assassins, murders and mayhem, bugs, the CIA and a family man. Everything a healthy boy could want. The writing style was simple and breezy without feeling amateurish or plodding, and I learned more about bugs than in a dozen National Geographic specials. I think I will look for some more titles from Mr. Fitzhugh.